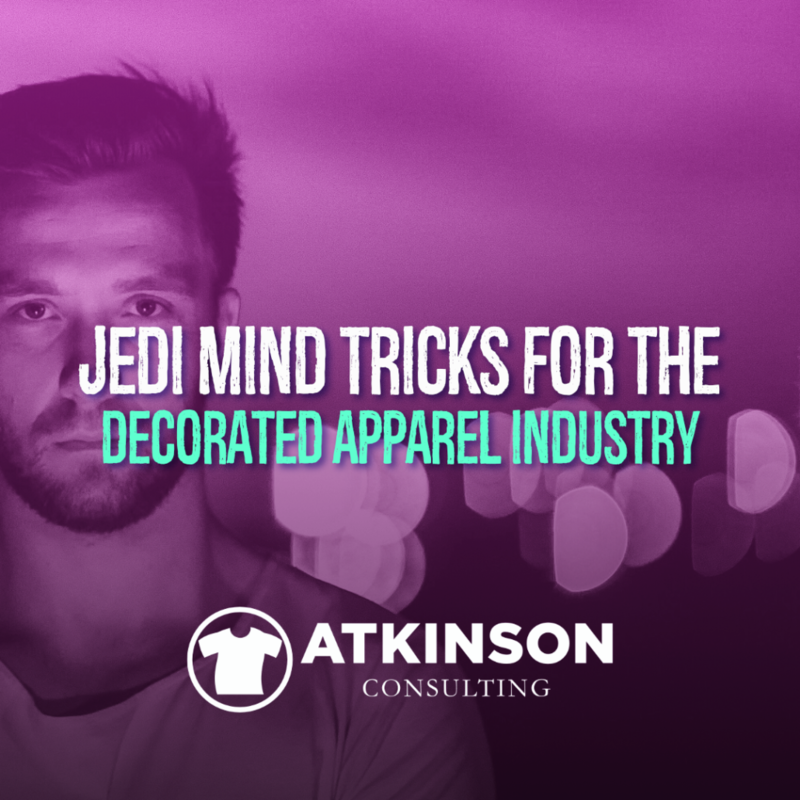 Don’t you wish you could pull off some “Jedi Mind Tricks” in your shop? Believe it or not, you can deploy these in your shop with some simply applied lessons in human behavioral studies. Get people to do what you want them to without begging, or dropping your prices at the first sign of resistance. The first Jedi Mind Trick we want to discuss first is the notion of Anchoring. This happens all around you every day and you might not even be aware of it. Anchoring is all about language. It’s conditional and 100% made up. What’s the difference between a large coffee at most drive-in fast food places ($1.49) and a Starbucks ($2.45)? Starbucks makes about an extra $0.96 and calls it a Venti instead of a Large. In fact, the size small is called a Tall, and the medium is called a Grande. What’s going on here is that the words Starbucks use for the sizes trick your brain into thinking, “Hey, I’ll pay you a buck more…no problem.” They are anchoring the thought of increased value. With a gentle wave of their hand, and a misspelled name later, your barista pours you a hot coffee that you will gladly pay more for than another place that serves hot coffee a block away. In fact, just using the Italian name for the coffee server, barista, even magnifies the effect. In your shop, what can you rename to have a similar effect? Let’s say you have a line of fishing shirts. Since you insert your own custom tags, could you rename the sizes, Guppy, Bass, Grouper, Tuna, and Orca? Would that inject some fun into your line of shirts? Or, could you call your art department the “Creative Lab”? Maybe your sales team are “Branding Professionals”? Start using “Innovation Magicians” instead of Production. The idea here is to deploy a new language to enhance the perceived value of what you do in your shop, just like Starbucks. What do you think might happen if a new potential customer met with a Branding Professional about their idea? That gets sent to your Creative Lab so the Innovation Magicians can produce the happiness your customers desire. Starbucks isn’t selling coffee. They are selling the experience. Coffee is the vehicle that gets you there. How can you change the experience with how you do things? Do you know people that won’t start something because, in their brain, they have already failed? Believe or not, people will commonly put problems in front of something in order to be able to say why it wouldn’t work. For example, if someone thinks they will fail a test, they might not put any effort into studying for it. They produce the problem by not putting in the effort. It becomes a self-fulfilling prophecy. So think about your shop for a second. Is this why you haven’t learned puff-embroidery, waterbase screen-printing, or how to cold-call for sales? You tell yourself it won’t work, and then Presto! Another Jedi Mind Trick here…but this time from the dark side of the force. What if instead, you flipped the script on that? Instead of Self-Handicapping, you practiced Self-Actualization. Have you heard of this? Self-Actualization is when you visualize you succeeding. Athletes do this as part of their pre-game ritual. Visualize how nice it would be to run orders with puff embroidery on hats. How pleased would your customers be if you knew that skill? The same goes for waterbase screen-printing or cold calling in sales, as examples. In your mind’s eye, see yourself doing these correctly. How do you feel? Play into your inner strengths. What do you do well? What’s missing? Get help with that part. This Jedi Mind Trick is focused on comparison positioning. While there are plenty of tire-kicker cheapos out there, plenty of folks will happily pay more if offered better solutions to their problems. The challenge a lot of shops have in trying to gain better pricing in their markets is that they don’t do a decent job of communicating WHY. A Good, Better, Best platform helps with that. This trick is everywhere around you. From insurance plans to airplane tickets, people make purchasing decisions based on comparative information. Sure, there is a percentage of folks that go low. No problem, we have something for you. A good chunk of customers want “the best”, and will gladly spend more if you let them. Who wouldn’t want that? However, the biggest group will usually be with the middle pricing tier. The thinking is that nobody wants to be the cut-rate slob, and the elite level seems like it is too much. Like the choice Goldilocks makes, the middle is “just right”. But if you are always quoting the low end of things, this could be an economic boon for you. This could be with the garments you select. The amount of post-production work offered (hang-tagging, relabeling, polybagging, etc.). Stock colors or custom mixed? It’s up to you to define it. What makes the most sense of your customers? Define the Good, Better, Best for your shop so it is instantly and easily understood. People have to instantly recognize it with zero effort on their part. The last Jedi Mind trick is about eliminating risk for your customers. Why won’t someone commit to using you the first time? Because at the other end of that process they aren’t convinced that the outcome is what they desire. If we don’t know what is going to happen in a certain situation, we’ll avoid it like the plague. Your job, young padawan, is to make people feel comfortable. At ease. There are a few ways you can do that. Why is Sunday the most popular day at Costco? Holy smokes it’s because about every fifteen feet there is another person handing out or cooking up free food to try. Think about the effort required to do that in that size store, and the amount of product they simply give away. Because they know that you might be happy to try their company brand Kirkland maple syrup, muffins, or coffee if it was available to you. How else are they going to convince you to buy a 38 oz jug of pancake syrup? The risk is that you won’t like it. The mega-size risk goes with the mega-sized bottle. When they prove it’s delicious, it’s an easier sell. The Jedi Mind Trick is that you only came in for the deal on the toilet paper. $187.93 later, you are loading thirty more items that weren’t even on your list when you walked through the door. A giant bottle of syrup included. Therefore, try embroidering or screenprinting a different item with the same image for a customer. Maybe they will place an order for some hats, tanks. an apron, or even hoodies. It’s already set up on the machine. Eliminate that risk to try something different. Remember, it doesn’t matter what you say about your shop. What matters is what your customers say instead. For your shop where is that? Your website or Facebook page? Is it a video or a written phrase? How often are you posting? In your customer’s mind, your brand and professionalism are defined by how customers relate their experience with you. When you have overwhelming social proof, that risk is considerably lower. Do your shop a favor and invent an easy way to collect these testimonials. This could be with a simple survey you automatically send through MailChimp, or maybe even capturing the box opening reveal with your smartphone. Very rarely do customers send you these out of the blue. Customer testimonials are like fishing. Unless you are actively doing it, you won’t land any. Get some hooks in the water. One tried and true method of ensuring low customer risk is a guarantee. Do you back up your work if something goes wrong? Most shops do. Why not get that in writing and put it out there for others to see? Of course, you can load it up with clarifications and legal stuff to protect you…but the idea is to push your potential customer over to your side. A guarantee is the Jedi Mind Trick that works because it builds trust. Maybe you are doing something in your shop that could be considered a Jedi Mind Trick. Take a second and drop in a comment and share it with this article! (Waves hand) “You know you want to share your success story with others”. These days, it’s all handled on my cell phone. 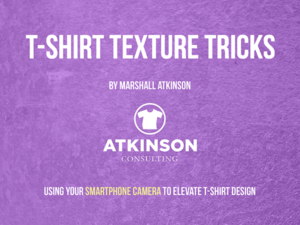 “T-shirt Texture Tricks” is built for those that have to constantly answer the call of “Do something cool” for art direction. Interesting textures are all around you. Use them! With this $29 e-Book, I’ll show you how to use them and even teach you how to make your own spot color seps in Photoshop the easy way.